Wrestling in America was on a bit of a decline. The luster had worn off from the 80s boom period and scandals had pushed some fans away from the product. The WWF was originally going to hold this PPV in Washington D.C., but Vince realized that their overseas business was still doing well. He decided to move SummerSlam to the UK for the first time. The decision resulted in some changes to the card. Bret Hart was originally going to defend his Intercontinental Title against Shawn Michaels, who he had feuded with all summer. (Including a Ladder Match that would be released on home video.) However, when the event was moved to England, they decided to have Bret face the British Bulldog. This bout would be billed as the main event because Bulldog is the hometown hero. Shawn Michaels would receive his title shot at a later date and they placed him in a filler feud for the moment. The feud between Bret and the Bulldog was built around the fact that they’re brothers-in-law and the story is that their feud is dividing the family. Some members sided with Bret and others sided with Bulldog, as tensions began to rise. 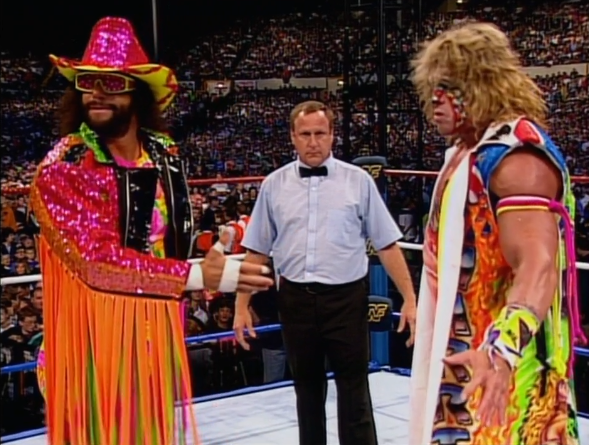 The other major feud for this event is Randy Savage defending his WWF Title against the Ultimate Warrior. 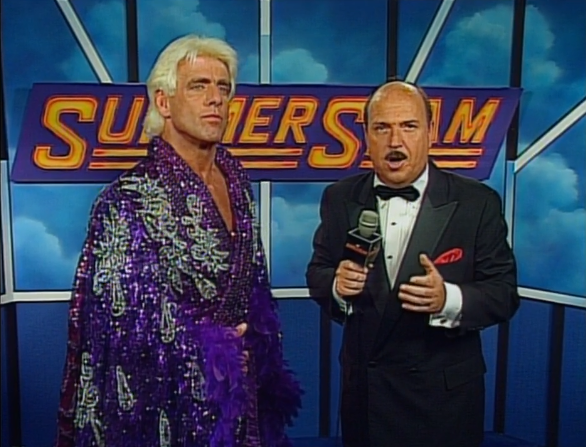 Ric Flair took exception to not getting a rematch, so he and Mr. Perfect decided to play mind games with the two men. They began spreading rumors that one of the men had sold out and asked Mr. Perfect to be in their corner, but they wouldn’t say who. They even attacked both men at different times to blur the lines of who was being swerved. It doesn’t make a lot of sense and it’s hard to understand why either man wouldn’t see through the entire thing. The WWF was holding off on a Savage/Flair rematch until later while trying to build Warrior as a contender. Plus, Flair had been dealing with issues of vertigo around this time, so they wanted to give him time to recover. In other news, there have been some departures and debuts since WrestleMania. Sid Justice quit the company when he not only failed a drug test but was also accused of tampering with it. Meanwhile, two new wrestlers made their TV debuts. The first is Scott Hall, who now has the gimmick of Razor Ramon. The character is based on Tony Montana from the movie Scarface. Hall would heavily tan and adopt a faux-Cuban accent. He would also borrow many of Tony Montana’s quotes about how he deserved the world and everything in it. It was never outright stated, but it’s implied that the character is a Cuban drug dealer, hence the nickname of Razor. (Razors are used to cut cocaine.) Razor doesn’t appear on this show, but he is mentioned on commentary. The other debut is the gimmick of a former prisoner named Nailz. The story is that he accused Big Boss Man of abusing him in prison and now he wants revenge. He debuted by attacking Boss Man, cuffing him to the ropes, and beating him with his nightstick, which Nailz stole. The commentators tried to play like Boss Man is innocent, but I’m pretty sure Boss Man’s whole gimmick when he debuted was beating jobbers with his nightstick. (I guess we’re supposed to forget about that.) One thing that Nailz was notable for were his strange promos where the WWF used distortion to make his voice sound lower. They were sadly the only interesting thing about him. The show begins with a quick ad for ICOPRO! This is a supplement that the WWF developed in conjunction with the World Bodybuilding Federation. The wrestlers apparently hated it and it didn’t sell very well, so the WWF was left with a lot of unused boxes. They gave away some of them to the boys, which leads to a rather funny story. Mr. Perfect gave some to his son (Curtis Axel), but it gave him bad diarrhea during a little league game. Despite the lack of success, ICOPRO would be pushed on WWF TV for another couple of years. Next, they interview a few of the British fans about the event. Two girls in Ultimate Warrior face paint argue about Mr. Perfect being in either Savage or Warrior’s corner. Then, a kid with a rather unfortunate haircut says, “The British Bulldog is going to win, whether he wants to or not!” (Is this kid forcing Bulldog to win his match? What a heel!) They also show shots of London, while trumpet players play some triumphant sounding music. This was originally going to be for the Tag Team Titles, but the Natural Disasters defeated Money Inc. on a house show to win the belts. The change was done to boost house show business, but it’s also because Hawk has been bad—again. Hawk’s issues with drugs have reared their ugly head once more. This match was already signed, so the titles were switched to move them away from it. Also, Hawk’s indiscretions may have led to what I’m going to talk about next. I have to address—this dummy. No, I don’t mean Paul Ellering. I’m talking about the actual dummy. 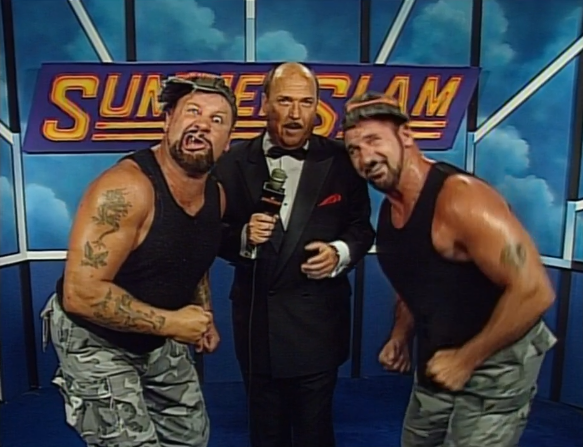 They aired vignettes of the Legion of Doom returning to Chicago to get back to their roots. They rummaged through the rubble of an old building from their childhood and discovered the ventriloquist dummy, Rocco. It’s apparently an old toy of theirs and they took it as their mascot. People say this was done to make the LOD more appealing to kids, but I think it’s partially punishment for Hawk’s behavior. Hawk didn’t take this new gimmick very well. He was reportedly heavily pilled-up for this match. 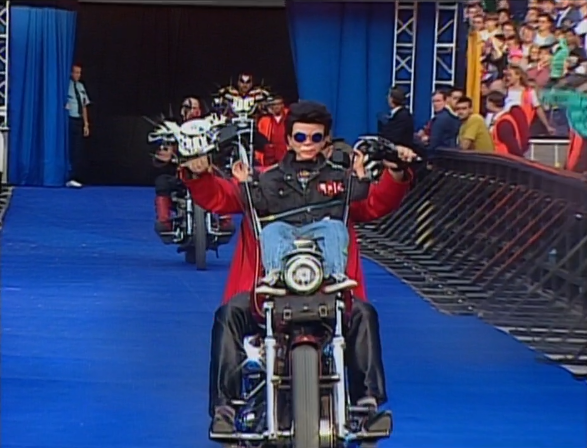 LOD rode motorcycles to the ring and Animal has said that Hawk parked his bike too close to his. Animal had to step off the wrong side and burned his leg on the tailpipe. You can also see how sluggish Hawk is during this match, so I believe the rumors to be true. This was an awful squash match. Nailz is a terrible worker and this gimmick only has one feud in it. The shelf-life is quite short. I’m not sure what they thought they could do after the Boss Man feud. 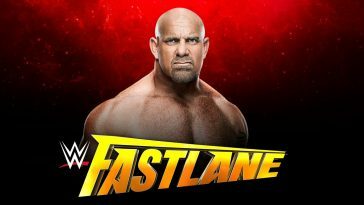 The rumors were that they wanted him to feud with the Undertaker. I’m sure Taker is glad he dodged that bullet, but don’t worry, the WWF has worse in store for him. 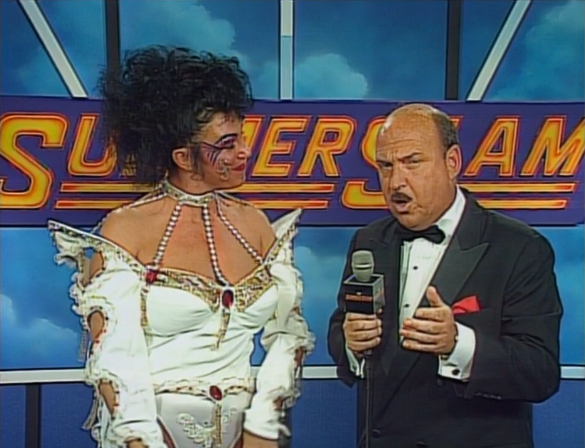 Next, Gene is with Sensational Sherri. He says she’s looking ravishing. (Somewhere, Rick Rude sits up and says, “Huh? Did someone call me?”) Gene shows her a clip from Superstars of Shawn Michaels interfering in a Bret Hart/Rick Martel match. He also shows Martel distracting Sherri and flirting with her, which she returned. Then, Gene reveals that Sherri added a stipulation to the upcoming match that neither man could hit each other in the face. Sherri says that’s right because both men are handsome and she sees no reason they should hurt each other. Gene asks her where she stands for the match and she replies that she will stand right by her man, but she doesn’t say who that is. Shawn then yells that it’s time to go before Gene can ask more questions. Shawn Michaels original match for this show was changed, so they put him into a filler feud with Rick Martel. I guess they figured that it would be fitting since they have similar gimmicks. They added the intrigue of Sherri being smitten with both men to try and give this story some substance. It’s passable enough for a quick feud. Martel is already in the ring when they return and he’s dressed in a tennis outfit. Vince talks about Wimbledon, so Heenan tells Andre Agassi to eat his heart out and Martel apparently hears him. He repeats what Bobby said. They start with an exchange of headlocks and leapfrogs before both men pause to gloat after outsmarting each other. Both men use shortcuts, such as hair-pulling and they even get caught trying to pull the tights for a cheap pin. Shawn responds with a superkick to the chest (because he’s not allowed to hit the face), but it only gets two. HBK also gets caught trying to pin Martel with his feet on the ropes. The two of them finally become frustrated with each other’s cheating, so the shoving begins and Sherri begs them to stop. She climbs onto the apron and pretends to faint, so Shawn checks on her. Martel takes exception and shoves Michaels away before performing CPR on Sherri. This leads to a brawl between them and the ref ends up counting out both men. I liked the story they were telling and the match was on its way to being pretty good, but then that lame finish happened. I know this was time-filler for Shawn, but I still would have liked to see a more satisfying match. These two appear to have decent chemistry. After the match, Sherri keeps peeking at Shawn and Rick fighting, but then she goes back to pretending to be unconscious. Shawn lifts her and tries to carry her down the aisle, but Martel punches him and Sherri falls. Then, Martel tries to carry her, but Shawn stops him. Shawn lifts her once more, but Martel reappears with a bucket of water. He threatens to splash Michaels, but he turns and dumps it on Sherri instead. HBK chases Martel to the back, while Sherri reacts in horror to being doused. The Beverlys attack immediately, but the Disasters thwart them with clotheslines and by sandwiching both men. Blake foolishly tries to slam Typhoon and fails, but the Beverlys soon take control when Quake accidentally hits his partner. Beau & Blake begin a long beatdown of Phoon that focuses on his lower back. They hit him with multiple double team moves and use ref distractions to cheat. Typhoon powers to his corner for a tag, but the ref misses it and the beating continues. They cut off Phoon’s attempts to tag out and Blake eventually hits him with the Genius’ metal scroll while the ref is distracted. However, Quake stops the pin attempt. Phoon finally makes a tag and Quake throws Blake around the ring. He even hits a belly-to-belly suplex, but the Beverlys try to double team him. Quake shoulder blocks both men and the Disasters hit an assisted corner splash before Quake hits a powerslam. Then, he hits the Earthquake Splash for the win. This was a slow and boring match. The Beverlys are not an interesting team, but they controlled most of this bout. It was incredibly underwhelming for a Tag Title Match on PPV. I can’t believe I’m saying this, but I think I’d rather have gotten the Disasters vs. The Nasty Boys. The Genius complains to the ref after the match, so the Disasters pull him into the ring and press slam him to the floor. (Were the Beverlys suppose to catch him? That looked rough.) Vince jokes that the Genius landed somewhere in Oxford. 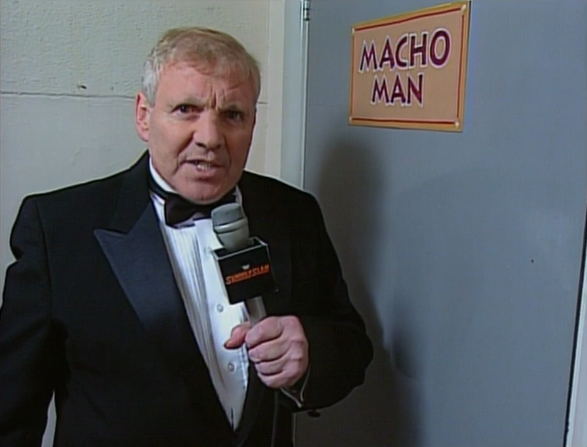 Next, Lord Alfred is outside the Ultimate Warrior’s dressing room, which has a paper mask on the door. It looks like a child made it. Al whispers that he has good reason to believe Mr. Perfect is in there, so he claims he’s going to breach his code of ethics by opening the door without knocking. (I’m pretty sure he always does that, but I guess that’s the joke.) He opens the door, but it’s immediately slammed shut. Alfred calls it a shocking and vulgar act of rudeness. Repo jumps Crush immediately, but Crush no-sells most of his offense. He press slams Repo, who bails outside, but Crush follows and clotheslines him. When they return to the ring, Crush catches Repo on a cross body and attacks him. He also hits a backbreaker, but Repo rakes the eyes. Repo then gets in a few moves, such as a back suplex, but Crush easily shakes off the attack. He then hits a belly-to-belly and another backbreaker, but he misses a flying knee-drop. Repo attempts some more ineffective offense until Crush catches him again and hits a powerslam. Then, he locks Repo in the head vice and Repo submits. This was nothing but a squash to make Crush look strong. They picked a fitting opponent and it wasn’t horrible, but Crush isn’t a great wrestler. It doesn’t help that his finisher is plain silly. This match felt like it belonged more on Superstars. 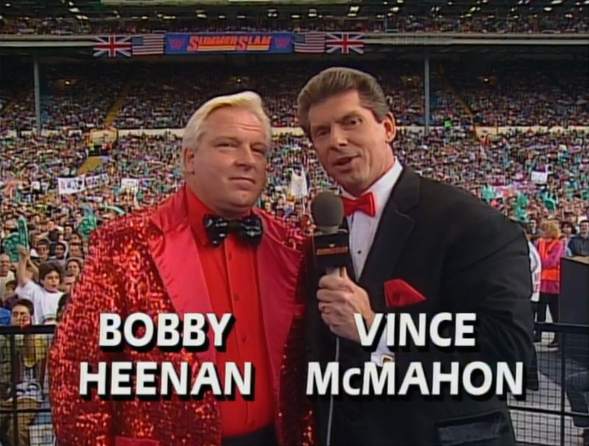 Vince then grills Heenan on what he knows, but Bobby says Flair & Perfect wouldn’t tell him anything. Vince doesn’t believe it and presses him further. Bobby mumbles the word, “Savage,” so Vince is confused. Warrior is wrestling in a singlet now to cover up how much smaller he is without the roids. (I personally think it’s a good look, but I wish he would stay away from the flesh tones. It’s kind of unsettling.) Both men come to the ring alone, so the supposed intrigue continues. (Sadly, Savage is also alone because Elizabeth decided she didn’t want to travel anymore. Their marriage had started falling apart and they would divorce not too long after this.) Before the match begins, Savage offers a handshake, but Warrior is hesitant. He accuses Savage of selling out and tells him the match is about the belt and respect. You can hear the Warrior spell the word, “R-S-E-P-C-T.” (Oh, Warrior! You never cease to amuse me.) They finally shake hands, but it quickly turns into shoving. Both men trade control of the match early. Savage hits clotheslines, but Warrior blocks a flying axehandle. Savage then tries to wear him down, but Warrior hits a jawbreaker and a facebuster. Savage finally takes control by yanking Warrior into the corner and hitting some axehandles, but Warrior catches him on one and hits a delayed backbreaker. He then works over Randy’s back for a while until Savage surprises him with a roll-up and a swinging neckbreaker. He also snaps Warrior across the ropes, but Randy’s back is hurting him too much to capitalize. Warrior then continues the attack on Savage’s back until he misses a clothesline and crashes to the floor. This brings out Flair & Perfect, while Savage and Warrior fight back and forth. Eventually, Perfect trips Savage, making him think the Warrior is the sell-out. Warrior takes advantage of the opening, but accidentally rams Savage into referee, Earl Hebner. 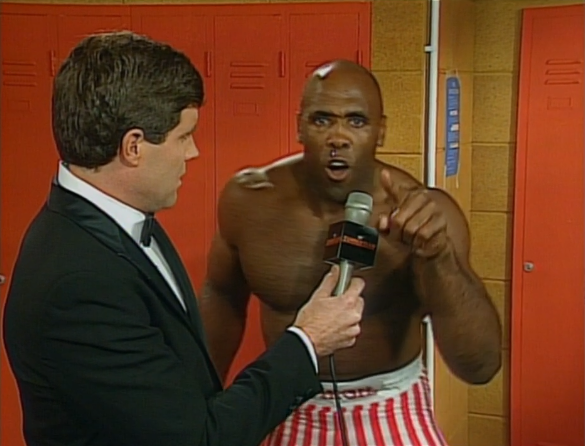 Warrior is only able to get a two-count off a flying axehandle because Hebner is dazed, so he argues with him. Poor Hebner is knocked out of the ring again when Savage knocks Warrior into him, so Savage checks on Earl. Flair & Perfect use that opening—to attack Warrior! Savage doesn’t know, so he hits the Flying Elbow, but a groggy Hebner only counts two. Warrior then hulks-up and hits multiple clotheslines and a shoulder tackle. He also attempts the press slam, but Flair hits Warrior with a chair while Hebner is distracted. Savage is confused and goes for the Flying Elbow again, but he realizes what happened and dives at Flair. Ric swipes Savage’s knee with a chair, so Randy can’t make it back to the ring before the ten-count. This wasn’t as good as their Mania VII match. It was a bit slow at times and that finish was disappointing. It wasn’t a bad match, but I couldn’t get into it. There was some decent storytelling within the match itself, but the overall feud doesn’t make a lot of sense. The one thing this did accomplish was keeping the Flair/Savage feud going and setting up events for Survivor Series, but it was mostly a letdown. Flair immediately locks Savage in a Figure Four, after the bell. Perfect attacks him and they focus their attack on Randy’s knee. The Warrior finally recovers and stops them. He grabs the chair from Flair and chases him down the aisle before returning to help Savage. The Fink announces the result and Warrior grabs the WWF Title. He hands it to Randy and lifts his hand, but Savage can barely stand. The Warrior has to help him to the back. Gene catches up with Flair & Perfect backstage and he starts yelling at Perfect about the ruse. Perfect tells him to be quiet and calls him a divot head before talking about their plans. Flair yells that he should have had the shot to begin with and he says that Plan-A might have slid by, but now it’s Plan-B. He then calls himself and Perfect the most perfect men alive, but Gene calls it a sham. Mr. Perfect is too busy talking about his bow-tie to care. 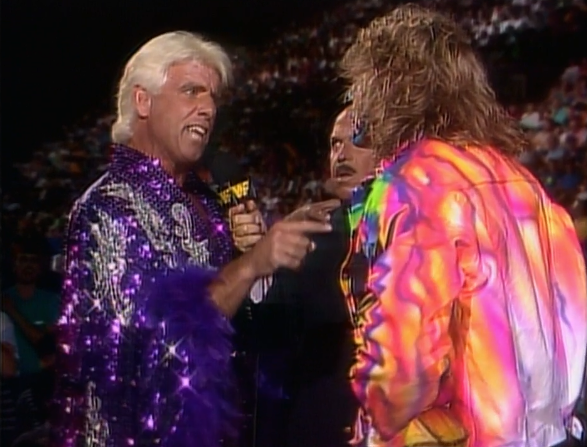 Then, Flair warns Savage that the belt is coming with him, but Perfect tells Ric not to reveal Plan-B. Both men woo, so Gene has enough and ends the interview. Now that Undertaker is a babyface, the WWF wanted to pit him against monster heels. He’s sadly in for a long run of terrible opponents and the first is one of the more unfortunate gimmicks in wrestling. Kamala is the character of a Ugandan tribal warrior. The story is that he was discovered in the jungle and trained to fight, but he’s easily confused by everything. He is accompanied by Harvey Wippleman and his handler, Kim Chee, which is the Brooklyn Brawler in a mask and a pith helmet. Kamala had been using this gimmick since his Memphis days and apparently, it was Jerry Lawler who created it. He was watching a documentary about an anthropologist named Kamala who was studying tribes in Uganda. Meanwhile, before the match, Vince and Heenan joke about Kamala wanting to cook the Undertaker in a pot. Kamala’s entrance gets almost no reaction, but the crowd pop for Taker as he rides to the ring on the back of a hearse. Kamala attempts to jump Taker, but he hits Kamala with throat chops. Kamala manages to reverse a whip, but he misses a corner charge and Taker hits Old School. He goes for another one, but Wippleman distracts him and Kamala pulls him down off the ropes. He then clotheslines Taker out of the ring, but he lands on his feet and grabs Wippleman and Kim Chee. However, he leaves himself open and Kamala attacks. He hits Taker with chops, headbutts, and kicks before ramming him into the steps. They return to the ring and Kamala misses a clothesline, so Taker hits a chokeslam. He follows it up with a jumping clothesline and attempts a Tombstone, so Kim Chee hits Taker with his pith helmet and the ref calls for the bell. Well, that was a waste of time. Kamala’s offense is terrible and the finish was lame. The worst part about the finish is it means we’re not done with this feud. This will sadly continue until Survivor Series. I feel bad for the Undertaker because this is only the beginning of a bad few years. It won’t really turn around for him until Mick Foley arrives. Kamala immediately attacks the Undertaker and slams him before hitting multiple splashes. He hits one from the mat, one from the second rope, and even one from the top. (I’m being generous. He kept landing on his feet first and then slowly falling onto him. You can barely call them splashes.) Kamala then tries again, but Taker sits up and Kamala retreats in fear. Sean Mooney is with the British Bulldog, who is all smiles until Sean talks about the family drama. Bulldog says he’s facing pressure from the family, but he didn’t make the match, Jack Tunney did. He talks about fighting for two long years to get a title shot. Then, he says that Bret is his brother-in-law, but when they step into that ring, he doesn’t know him and hasn’t met him. He only hopes the family can reunite after the match. Sean then says that Bulldog is under the pressure of competing in front of his countrymen, but Davey says that’s a dream, not pressure. He also says it’s his dream to become Intercontinental Champion. Before the main event, Fink introduces the Balmoral Highlanders, which are a band of bagpipe players. 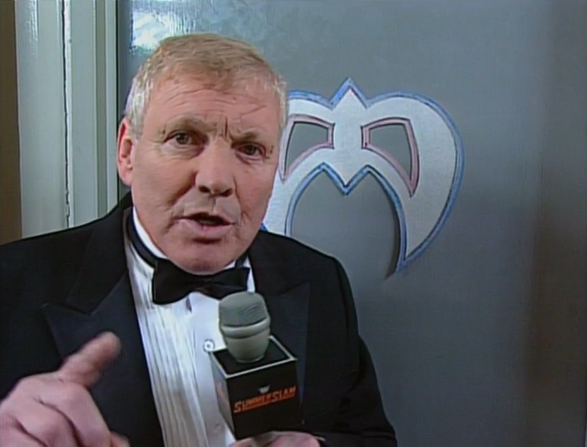 They play “Scotland the Brave” and Heenan jokes that he’s always hated hard rock. He says the bagpipes sound like someone pulled the tail off a cat. Then, Fink introduces a surprise. 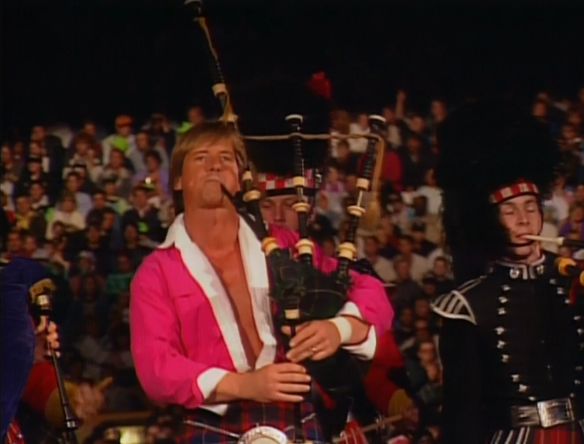 Rowdy Roddy Piper joins the band and plays the bagpipes with them. 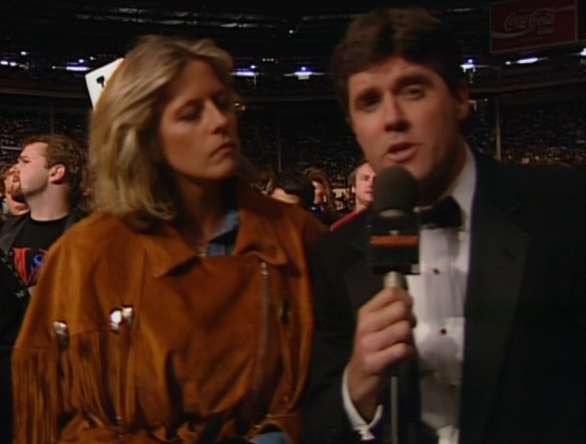 The crowd pop big for Piper’s appearance, but Heenan says they should get the hook. Davey knocks Bret out of the ring early with a shoulder block, but they quickly go to some mat wrestling. Davey works the arm for a bit and even catches Bret with a surprise crucifix pin, but Bret answers with an inverted atomic drop. (Vince oddly calls it a reverse piledriver. Vince! If you don’t know, just say maneuver!) Bulldog fires back with a monkey flip and whips Bret around, but Bret surprises him with a boot and hits a bulldog—on the Bulldog. Davey retakes control by slamming Bret off the top rope. (Somewhere, Flair grumbles.) However, Bret returns fire and sends Davey out of the ring on an O’Connor Roll attempt. He then hits a slingshot cross body to the outside, but Bulldog forgets to catch him and Bret has to improvise a sort of neckbreaker. They return to the ring and Bret wears down Davey before grabbing a sleeper hold. He keeps returning to it when Davey breaks free until Bulldog backs him into a corner. Davey then nearly botches a press slam, but Bret latches onto the ropes. Davey redeems himself by properly doing one before hitting a delayed suplex. Eventually, Bulldog even hits the running powerslam, but he only gets a two-count! Bret then reverses an apron suplex into a German suplex, so Bulldog answers with a superplex. Then, both men go down to a double clothesline, but Bret transitions into a Sharpshooter from the mat! (Bret apparently woke up his wife in the middle of the night to practice the move. He had the idea while in bed and wanted to make sure it would work.) Bulldog reaches the ropes, so Bret attempts a sunset flip next, but Davey hooks Bret’s legs and turns it into a pin for the surprise win. This was a great match. I love the story they told and it had some good drama. The crowd was absolutely mental for the match, which helped a lot. The rest holds can be excused because Bret had to call so much of the match on the fly and they never let them go on too long. This match was probably the moment that cemented the next evolution in Bret’s singles career, but we’ll get to that soon enough. After the match, Davey collects his belt, while Bret looks disappointed. Bulldog offers a hand to Bret, but he ignores it and begins to leave. They show Diana crying, while Bret takes a moment to contemplate his next move. He finally has a change of heart (no pun intended) and shakes Davey’s hand before embracing him. Diana then joins them and the three celebrate while Vince praises the match. Fireworks then explode, as Vince says goodnight. – Bret/Bulldog was a classic match. – The crowd was hot for everything and quite an impressive sight. – There were some good promos. – Everything else was mediocre or bad. – The random tag title switch before the show made the two tag team matches seem less important. 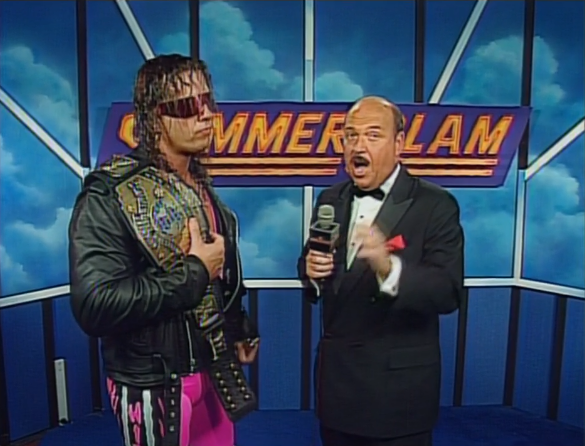 I have to give it to Bret Hart for leading Bulldog through that match without making it obvious. Don’t get me wrong, Bulldog still did well despite being out of it, but Bret has to be commended. Also, I enjoyed Bret’s promo. I know it sounds like I didn’t like the show, but it was still a surprisingly easy watch. There’s only one stand-out match, but the hot crowd helped make up for the rest. It’s not great, but it’s not a bad overall event. It also helps to have a unique atmosphere from the other shows. My next review will be WCW’s Halloween Havoc ‘92, so get ready to spin the wheel and make the deal! 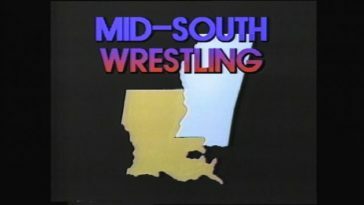 Next article Mid-South Wrestlefest 1985!